One of the most common questions I get asked on this trip is, “Which one of the things on your list do you think will be the hardest to accomplish?” The unfortunate thing about today is now I’m going to actually have to think about my answer next time someone asks that question. 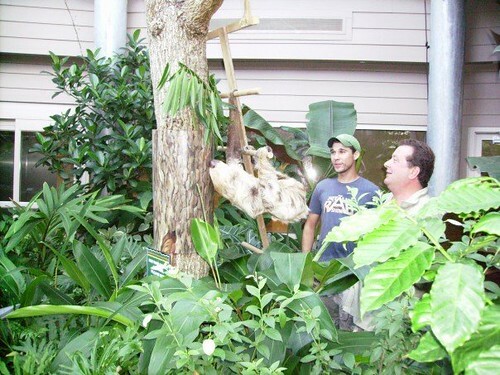 My stock answer for the last couple months has been “#18 Pet a sloth.” But take a look at this picture!!! The day started out bright and early with a drive to the Cincinnati Zoo where we met Dan Marsh, the Assistant Director of Education, who introduced us to Doug Feist (Yeah, that Doug.) the Animal Manager. Words like incredible, knowledgeable and friendly don’t do justice to either one of them, they both went above and beyond to let me have my little moment of sunshine and I’m not afraid to admit that I’m not a talented enough writer to aptly describe how much I appreciate it. Mo had much longer and softer fur than I had expected. It was still relatively coarse…like horsehair only softer. She was also surprisingly animated and had made guest appearances on Jay Leno and Conan O’Brien. After petting Mo(!) and getting the quick tour of the educational animal room we took her down to the “rainforest” and let her climb up into her tree were she spends the day. and I spent the next couple hours wandering the zoo before meeting back up with Doug to watch the cheetah’s daily run. Holy crab cakes those things are fast! 0-60 in less than four seconds! 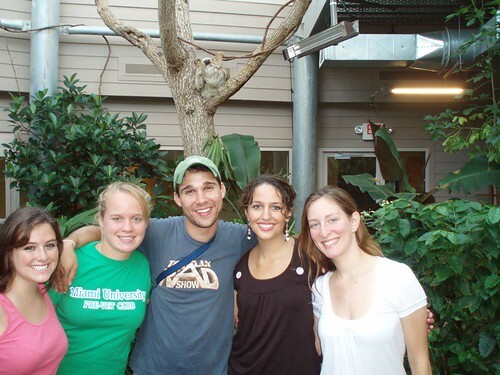 I really can’t thank Dan and Doug enough for all their generosity and Olivia for all the legwork that led to our meeting with the zoo crew and the rest of the team (Ellen, Emily and Libby) for sharing the experience with me. Thanks so much, everyone! That’s all I’ve got for tonight…I’m pretty exhausted. More on my Ohio adventures tomorrow PLUS, sloth petting video in a few days! Excuse the site, there are quite a few changes in the works but only so the fun and excitement will be easier to navigate. Ohhhh that is sooo AMAZING! GREAT job!! Also I was thinking maybe your hardest ones can be #’s 21 or 22…I always thought they would be though…more so than this one in fact. Brett this is so awesome! You may or may not know this about me, but I’m a huge zoo freak! We have a membership to the Phoenix Zoo and go all the time! All the time! Seeing you accomplish this goal has definitely been one of my favorite! Can’t wait for what’s next! So what’s next? oooh! That’s Slothtastic! I would challenge him to a race…and then let him win so he feels better about himself. Think about it. Let him win? 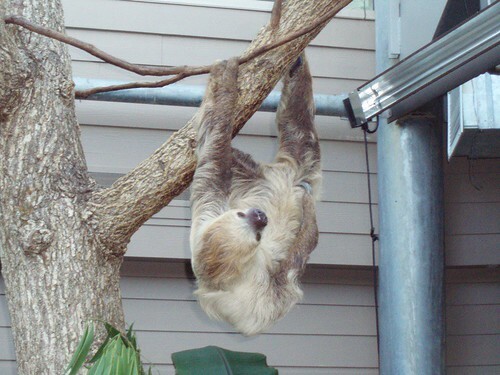 Sloths don’t need our charity…when was the last time any of us were on a list of “must pet before I go home”? I would dominate Mo in a race, no holds barred, so I feel better about me. ps- Completely awesome Brett, congrats! Hi Brett! I’ve been a bad amtrekker fan, I havn’t been up to date with the postings…but I’m getting there! Hey I saw a special on Disneyworld today and thought of you cause they interviewed all the behind the scene peeps. AND I loved Harvey by the way…and there was something else too….eh whatever, you pet the sloth and I’m just smiling right now.